It is very important to make sure that the pronunciation of the vowels is done 100% correctly. Being able to recognise the exact vowel sound is equally important in order for the technique to work in the right way. If you make the wrong vowel sound you might risk not being able to perform certain modes, pitches and sound colours. Therefore, it is very important that you take time to understand exactly which vowel is called for. 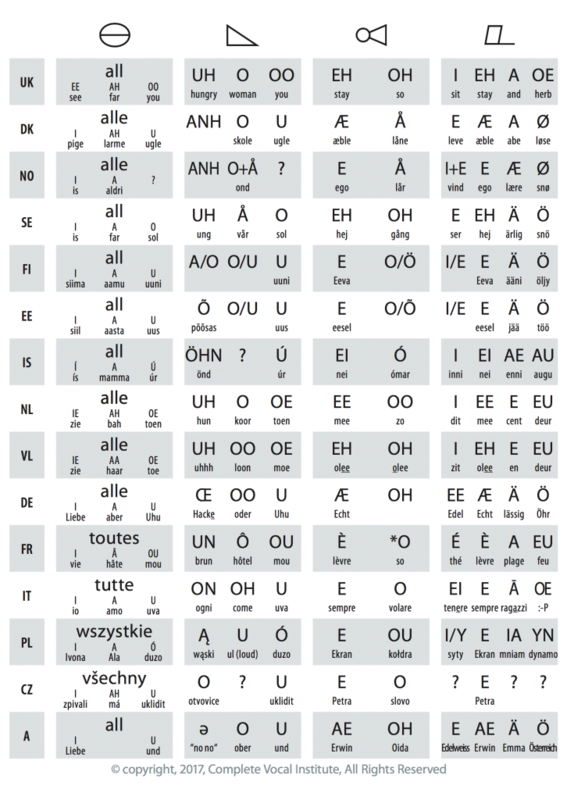 To do this correctly, spend time learning the vowel sounds from the CVT Sound Library and compare them with the vowels used in English and/or your own language. Different languages and dialects can trick you into thinking that you are using the correct vowel. This is why, in the beginning, you must spend time familiarising yourself with the exact vowel sounds. If you confuse the various vowel sounds you might get problems in achieving the modes Curbing, Overdrive and Edge, therefore be absolutely sure of the exact vowel sound before you start the exercise. A lot of words have incredible variation between various accents and also some vowel sounds might not exist in some languages, but even so it is important to get to know the exact vowel sound as heard in the sound examples from the CVT Sound Library as these exact vowel sounds are often a necessary condition in obtaining certain vocal modes. Due to different accents these words may be pronounced in different ways, so I will encourage everyone to listen to the sound examples to get the exact pronunciation we use in this book.